Whilst walking around the percolation pond area yesterday I saw quite a number of small dragonflies flying about and landing regularly. They were a dark purplish-black colour and much smaller than the other dragonflies I have encountered on my birdwatching trips. As they regularly perched in the open I was able to get a few nice photos of them and they turned out to be Purple Darter (Diplacodes lefebvrii) and not the very similar Desert Darter. This darter has an iridescent dark-purplish sheen which gives rise to its name the purple darter. It is a small dragonfly, the smallest Libellulid, and is also known as the black percher, due to the male being almost entirely black, and to the species’ habit of regularly perching on grasses and other vegetaion. In contrast to the male, the female is a vibrant yellowish-green, with small black stripes across the thorax. The wings of the purple darter are very clear, although they turn slightly amber towards the base of the hind-wing. This amber patch is bigger and darker in females. Both the male and female purple darter have a greyish-brown cell, known as the pterostigma, near the tip of the wing. The purple darter has a widespread distribution, primarily occurring in Africa, outside of forested areas but can also be found on several islands in the Mediterranean Sea, as well as across the southern half of the Iberian Peninsula, and through Arabia to the Indian subcontinent. They can be found in a diverse range of well-vegetated freshwater habitats, such as swamps and marshes and can also inhabit small stretches of river, provided there is an abundance of tall grasses either side. 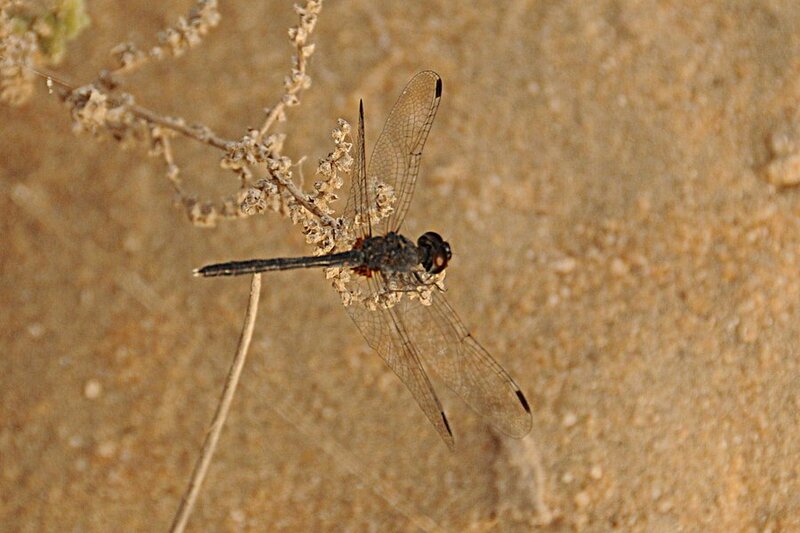 Both sexes can be easily confused with Desert Darter (Selysiothemis nigra) and close examination of wings is necessary to distinguish them. 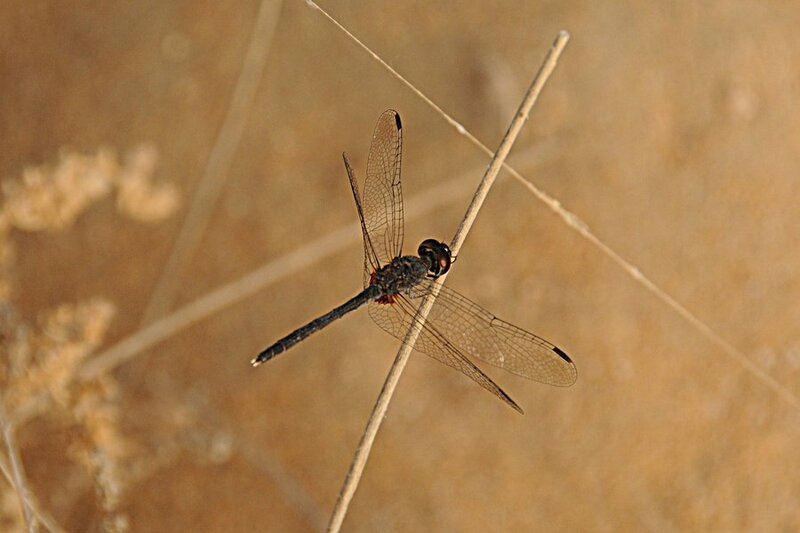 Desert Darter is less common than Purple Darter although is frequently encountered in Eastern Saudi Arabia and is migratory over large distances. It does not frequent waterways, but is found in open spaces settling on stunted grass. It is distinguished by its large, fragile-looking wings and distinctive ‘equals sign’ shaped pterostigma, the dark coloured cells near the tip of the wings. The wings are clear and shiny making the veins difficult to see.